with your partner quickly becomes survival of the fittest of relationships; only the strongest will survive. Do you have what it takes? Check out some helpful tips outlined below! Before you start sharing a space with your partner, make sure you remove any excess items, or “baggage” from your life. It’s important to make sure that only the essentials make the cut when combining spaces and lives. Whether it’s getting rid of the items in your junk drawer, or donating a few bags of clothes, make sure you are starting this journey on the right foot — and you have a clean and relaxing home to protect and nurture your relationship, not a cluttered one! Make sure you understand each other’s storage needs, and talk about space. If you’re converting one of your places into your new shared home, try dividing up bathroom or closet space for starters, then get creative from there. And if you are looking for a new space altogether, consider both of your storage and personal space needs before signing a lease or buying a home. Remember, your space is no longer your own, so whether it’s sharing food in the fridge or picking your side of the mattress, “compromise” will be your new mantra. While money is usually a tough topic for couples, it is important to discuss finances before taking the next step. First, figure out your budget on the home, groceries, furniture, etc. Decide how much you can each contribute. Are you going Dutch and splitting things down the middle, or are you each in charge of taking care of different finances? If you don’t know the answer to that question, drop everything and call your partner right now! Take a moment to discuss your goals for the relationship, and why you want to move in together in the first place! Many couples make the mistake of moving in together too quickly, (because of convenience, saving on gas money, someone’s lease is up, etc.) and not because they are completely ready to take the next step in a relationship. 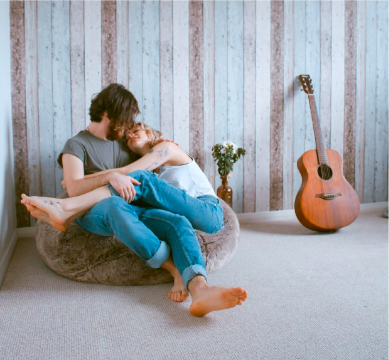 Sharing your home is a very intimate experience — you see your partner at their best and worst, and only the strongest relationships are meant to last. Make sure you’re both ready. When you’re all moved in with your partner, it is easy to monopolize each other’s time. Face it, they’re your love and best friend all wrapped up in one — of course you want to spend all of your time with them! However, unlike living apart, you will be around this person constantly. So to avoid ruining a good thing, or getting tired of each other’s presence, establish your own independence. Make sure you are doing things for yourself, in addition to catering to your partner. Have alone time, or go on weekend trips with your friends. Being able to spend time both together, and apart, is essential when living with your partner, and maintaining a healthy and sustainable relationship.